I receive frequent questions about batteries, battery care and installation. Here a few of the tips which I dispense when I answer. Know your battery! Check your receipt, if you still have it, to learn the battery’s age. Batteries have a way of “aging” because, once installed, they are out of sight. One of my VW friends told a group of us recently that when he could not start his car, he inspected the battery and found it to be 10 years old! Well—that’s a ripe old age! So get that detail out of the way first. If you have a test meter, check the voltage on your battery. It should read at least 12.50 volts and as much as 12.7 volts, depending upon its age and charge. When a battery drops to 12 volts, it will not function as designed. If you do not have a test meter and/or cannot charge a battery, it’s best to simply remove the battery and take it to a battery shop to have it tested and charged, if necessary. Battery shops can do it all, including selling a new battery if the need arises. If your battery appears to need charging, remove it from the car. I like to use nitrile gloves when handling the battery, if it is of the liquid type, because it is more than likely to have some acid residue on it. Don’t get this onto clothing or anything else. Battery acid is ‘hungry”. I loosen and remove one of the cable connectors and push it out of the way of the battery so that it won’t stray onto the pole and spark. When loosening the connector bolt, do not allow the tool to touch metal and spark. I like to use a large piece of cardboard box in an open area for doing the charging. Place the battery onto the cardboard because the liquid will bubble into tiny mist-like droplets as the battery charges. The cardboard will catch these. Then dispose of the cardboard when the process is completed. Clean the battery posts. If you do not have the tool for this, use sandpaper for the purpose. Make each pole nice and shiny. Given that this is a liquid-filled battery with removable caps, remove the caps and fill each cell to the indication in the hole. Use distilled water. Run a heavy-duty extension cord to the charging area. Leave the caps off the liquid-filled battery to avoid building gas in the closed cells. Connect the charger to the battery first. Then plug in the extension cord. Try charging the battery on a slow charge—usually 2 amps on most home-owned chargers. Leave the battery charging in this slow manner but check it from time to time. The meter on the charger should alert you to the progress. Meanwhile, you can do some “homework”. Inspect the battery compartment. Remove the nut and washer and the clamp. Are they rusted? If so, clean them thoroughly. Also, clean the stud where the clamp fits. Clean the area where the battery sits. You can neutralize any light corrosion by using a solution heavy with baking soda and water. Pour a little bit onto the corrosion and allow it to bubble I hope that you still are using the nitrile gloves and are avoiding getting any of the corrosion onto your clothing or anything else. Use paper towels to clean the area and dispose of them into a trash container. Once I have removed this residue, I pour a little fresh water onto the affected area, then use paper towels to dry it. Note the condition of the Ground (Negative) Strap. Is it corroded? If it is corroded it will show blue-ish-white deposits. Remove it completely and soak in a baking soda-water solution. You will see the baking soda begin to bubble away the corrosion. After a lengthy soak, remove the strap and thoroughly rinse, using water. Best to do this outdoors because it’s a little dirty to do in the kitchen sink. Allow to dry well. If you have compressed air, you can dry the strap more quickly. Check the condition of the bolt holding the Ground Strap to the body. If it is corroded, remove and replace with a new bolt and washer–or clean it well. If you have access to a tap, clean the bolt hole threads (8mm X 1.25). Reinstall the cleaned strap. Clean the insides of the Positive and the Negative (Ground) connectors. There are tools for this job but if you don’t have one, you can use a piece of sandpaper. Roll it into a cylinder and turn it round and round inside each connector until the metal appears shiny and clean. Note the condition of the Positive Cable—is it in good condition? Are the wires well connected to the connector? Some battery chargers will alert you to a full charge with an audible sound. Others may have just the meter. Once the battery is fully charged, first unplug the extension cord—then remove the clips from the battery. Use a paper towel to clean the top of the battery to remove any acid which may be there from the charging process. Clean the caps and reinstall them. Set the battery into the battery box with the poles according to the correct connectors—plus is for the Positive Cable and minus for Negative—the braided Ground Strap. Before connecting the cables, secure the battery into its place using the clamp. Now, you are ready to connect to the cables. Double-check before actually connecting to be sure that the battery is positioned properly—it does happen, occasionally, that someone will put the battery in backwards. Once the connectors are in place, tighten them for the best conductivity. Someone posed the question about sparking when the second cable is connected. This is okay. Put the last cable firmly onto the second pole and push it into place—it may spark a bit when it initially touches. No one has ever come close to dying from this! Then tighten the bolts on both. While doing so, don’t allow your wrench to touch the car frame or you will get a good spark! IF you find the need to purchase a new battery, make sure that the shop knows the proper make and model of your car. You want the proper-sized battery which will fit into the battery compartment. 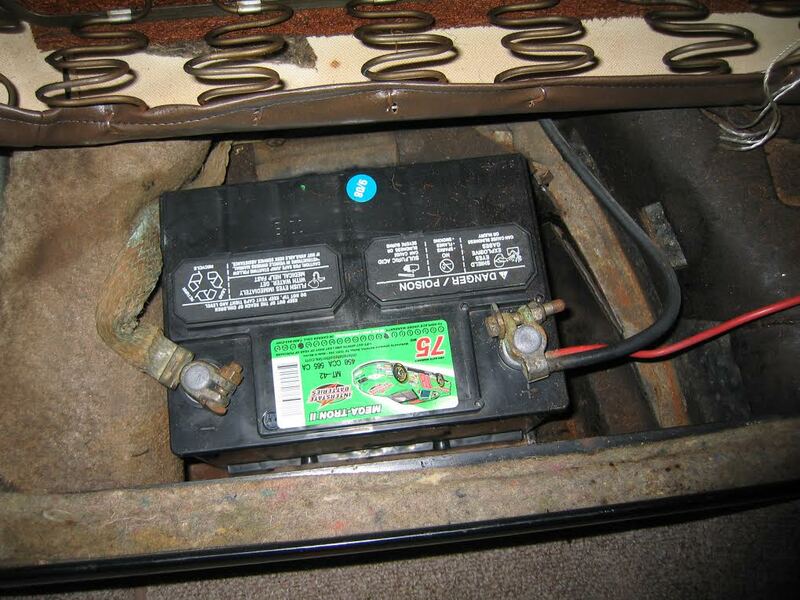 An over-sized battery can touch the seat-bottom springs and short. Furthermore, it may not seat in the battery box to be clamped into place. Now go out and drive your Beetle with contentment. You’ve just resuscitated it. Great article, Jay. I’m glad we finally got around to this one. Such a simple thing that probably goes overlooked. 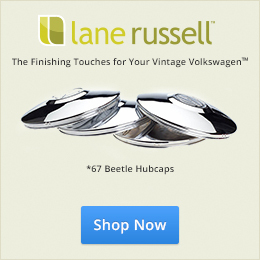 You’re helping pave the way for future ’67 Beetle owners. I appreciate everything you do for all of us around the world. I’m sure the readers would agree. Thanks, Jay. I appreciate you sharing your knowledge! Now there is some sound experience guys/and gals. Great work Jay…as usual. You didn’t mention use of a “trickle” charger for long period storage. Your thoughts? Leave battery under back seat or remove? Mike thanks for the question! Jay, I have used the trickle charger method for years and found it to be ideal in my winter storage application. Temperature range is from -10 to +25 on average for approx. 4 solid months here in Northern Michigan. I remove the back seat, leaving the battery as is. I do clean posts but thats it. I connect positive and negative clamps and make SURE its set at 12v on my 67′. Most modern trickle chargers have safety features that will not overcharge your battery or drawn it down to 0 is you accidentally set it to 6v on your 12v battery. I keep my beetle plugged in, only unplug it to connect the battery and start it up at least once every other week. Best investment I’ve made! Easy and reliable has been my experience. Great battery article. I switched to an Optima sealed battery and love it. No maintenance at all, and it holds a charge longer during storage and inactive periods. It was more expensive, but so far worth the cost. Due to its height, a sideways installation with a spacer wood block was used to retain the original mounting strap and lid. 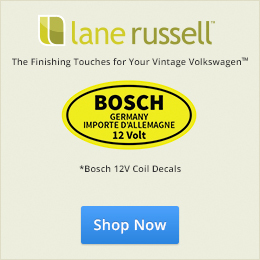 I have a 1964 Beetle, so its 6 volt, but a 12 volt is available. I almost got one. I’m not sure why I didn’t..
Good Information Jay: Additional suggestions: When disconnecting battery from the circuit,remove the ground strap first, thereby disabling the circuit.. When connecting battery, install the positive cable first, then the ground strap, that normally will alleviate the sparking syndrome. In order to preserve the battery terminals and cable clamps one can cover with Vaseline or buy at parts store a kit that has two felt washers-sometimes red and green or similar and place on the terminals-works well. I live in SW Florida and the weather here stresses the battery more than a cold climate. I definitely agree with Quinn about the Vaseline and felt pads, as well as the sequence when removing and replacing the cables. Also, if you want to be sure that you don’t get shocked if the wrench touches metal while loosening or tightening the nut and washer, cut off the finger of a rubber glove and slide it over the wrench. Well in addition to having three VW’s I also ride motorcycles. Something I have always done for my motorcycle battery is to keep it on a Battery Tender to maintain the charge. There are pigtails on the battery that match the pigtails on the Battery Tender. Just park the bike and plug it in! My bike is a 2008 with the original battery and it responds like new! Keeping that thought I have all three of our VW’s and one other car on Battery Tenders! Same idea; attach pigtails to the battery and when I park the car I reconnect the Battery Tender! Works like a champ and extends the life of your battery! Just a thought from a guy with five Battery Tenders plugged in all the time! I still check battery water though and the condition of the cables! But nothing beats keeping things going other than driving those bad boys! Can you attach the alligator clips directly to the positive and negative posts? The directions say to clip the negative to the engine block or similar. I have a ’67Bug and it is always on a battery tender. I was told that the gas that is emitted will ruin the interior. Is that true. I want to have the entire interior re-done, and can’t find a dry battery (no gas emissions) that will fit. I saw where one of the guys put in a optima on it’s side. I need a 12v and would that fit on it’s side, and is there a place to purchase the “side” mounting adaption? I am in an area that sometimes in winter is sub, mostly 10-20 deg. and up to 110 in summer. I know someone that would make be one of those adapters is there is a diagram. Like this site, interesting. Hello, Charlene…Thanks for reading 1967beetle.com! I think that what the Reader meant to say was that he lays the battery on its side. I do not know of any adapter to the on-its-side mount. If there is..I hope that one of the Readers will respond to your request. Laying the battery on its side will be fine. You’ll just have to mount it so that the cables can properly be routed to their respective connections. Why don’t you talk with a battery company to ask what they offer? Try this Link: http://www.odysseybatteries.com/auto.htm AND this one: optimabatteries.com Measure your present battery so that you can give the information to the battery company representatives. Some of these do not need to be laid on their sides. 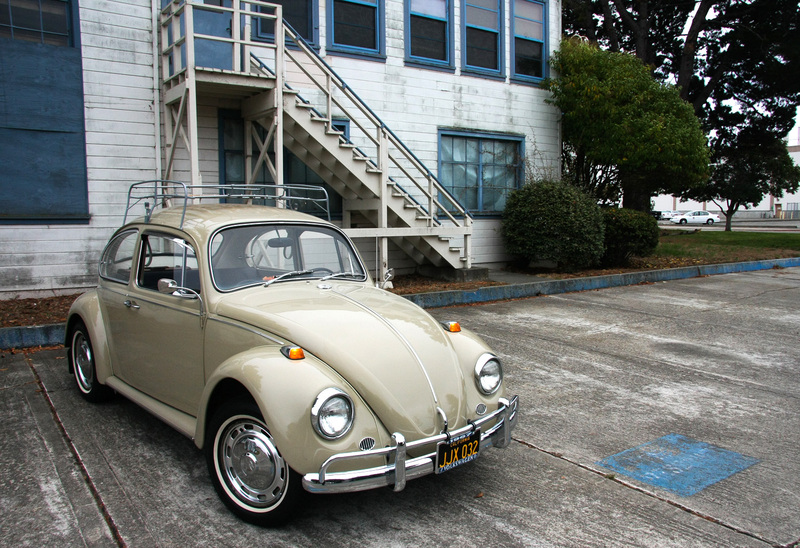 I just bought a 1967 beetle ….I need a new battery. To keep it pure is there a particular battery I should be looking for?